A J Balukoff’s living room was quiet Tuesday morning, save for the occasional sounds from nearby rooms, and grandchildren visiting Boise for a few days. Balukoff says he is having a quieter summer than he expected — a wry reference to the 2018 primary election, and his unsuccessful bid for the Democratic nomination for governor. In a few weeks, Balukoff’s Monday evenings will become quieter as well. He is stepping down from the Boise School Board. The volunteer job — and 21 years of Monday night trustee meetings — has given Balukoff a voice in education policy at the local and state level. “If you’re going to spend time doing volunteer work, this is a great place to do it,” Balukoff said. A trustee’s job is not only unpaid. It’s often time-consuming and unglamorous — with plenty of reading and homework beforehand, and night meetings that only draw crowds and receive media coverage when something goes wrong. Balukoff, an accountant and successful Boise businessman, says he viewed serving as a trustee from the prism of volunteer work. But many school districts struggle to find takers — especially in small towns with a small pool of prospective candidates. “It’s a commitment, and I can understand why districts have a difficult time recruiting trustees,” he said. Balukoff is retiring on his own terms and timetable. In 2012, when he last ran for re-election, he told district leaders that he would serve one more six-year term, then step aside after 21 years. “I think that’s long enough for anyone to serve,” he said. That quality was especially evident in 2011, as the Boise School District considered its response to then-state superintendent Tom Luna’s far-reaching education overhauls. The debate over the so-called “Luna laws” quickly became emotional. But Coberly said Balukoff insisted on a data-driven response — quantifying the district’s concerns about a pay-for-performance salary plan and funding shifts that would increase class sizes. Balukoff left an imprint on the district’s white paper criticizing the Luna proposals, Coberly said. Idaho voters rejected the proposals in November 2012, but their impacts remain. In the wake of the vote, legislators approved a range of education overhauls, including a five-year, $250 million career ladder plan to increase teacher salaries. But the debate leading up to the 2012 vote left teachers feeling they’d been turned into scapegoats, and Balukoff believes that this resentment lingers. Balukoff says the Boise district has been able to do some things that smaller districts cannot. With its built-in taxing levy authority — an anomaly in Idaho’s school financing system — Boise has money to offer higher salaries and keep veteran teachers in the classroom. Boise has been able to launch innovative programs — such as a dual-language immersion school and its Treasure Valley Math and Science Center — while other districts have been forced to limit their options and offerings. When asked about unfinished business, Balukoff quickly points to the early education gap. Affluent parents can pay for early education out of their own pocket. Some low-income families can send their kids to a pilot program in Boise’s Vista neighborhood, supported in part by a city grant. Other parents and young children are caught in between. Balukoff says pre-K and all-day kindergarten will prepare students for the rest of their school years, and eventually set up students to continue their education beyond high school. 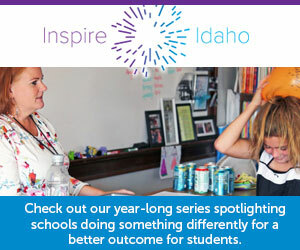 But without stable state funding, districts from Boise to Basin can do little more than run local pilot programs. In May 2014, Balukoff received 16,751 votes, enough to easily win a contested but low-key Democratic gubernatorial primary. Going into 2018, Balukoff expected to see more Democrats at the polls — and figured he would need 26,000 votes to again secure the nomination. Balukoff received 26,423 votes, beating his campaign’s goal. But Democratic turnout far exceeded expectations — and turnout broke in favor of former state Rep. Paulette Jordan. Buoyed largely by support from younger voters, Jordan comfortably won the primary with 58 percent of the vote. Balukoff says he has a cordial relationship with Jordan. They spoke during the Democratic state convention in June, and posed for a picture. From here, he says, it’s up to Jordan to decide what sort of role she wants him to play in the fall election. Balukoff will play a limited role in the Sept. 4 Boise School Board election. He will endorse the two incumbents on the ballot, Maria Greeley and Troy Rohn, but he will not endorse any of the four newcomers in the running. All six candidates run in the same pool; the top three vote-getters will be sworn in on Sept. 10. District administrators say Balukoff will leave a void. Coberly says he will miss Balukoff’s generosity. Deputy Superintendent Coby Dennis says Balukoff’s steadiness came through in his unfailing, and undisputable, desire to put the needs of students first. For his part, Balukoff says he will miss the relationships with administrators, teachers and fellow trustees. He also says he’ll miss a fixture of the trustee’s job: presiding over graduation ceremonies and helping to hand out high school diplomas. That already hits close to home. One of Balukoff’s 36 grandchildren will graduate from high school next year. Balukoff will be in the audience, but not on stage, when his grandson is in the procession. Branden Durst denied wrongdoing in an interview with the Idaho Statesman. But the former legislator has lost one prominent endorsement. The Boise State University administrator has received backing from several big-name politicos ahead of the Sept. 4 election.